Lucky for you, Rain or Shine Kids is giving away the celery green blanket today (a $36 value)! Which Rain or Shine Kids product would you most like to have? I love the plush blanket and they are having a sale right now! I love the b blanket! Brynn: the circles blanket, so fun! the b blanket is great! I would love the celery green blanket, it would go perfect with my carseat and stroller. I love the b blanket! These are so great. Love the WooBee blankets, and the b blanket is so versatile! I like the Brilliant Pistachio / Chocolate velvet bib. I really like the green celery blanket! I'm always in search for the perfect blanket! I love the circles blanket--so cute! oooh, i'd love the squares b blanket, that would be perfect! I love the b blanket. I'm kinda diggin the 'prints' stuff. Always need new bibs and burp cloths...have a drooly baby. The plush Woobee is what really catches my eye. Would love to win! I love the b blanket, with our weather it would be totally handy! I love that you can tie it, I can't tell you how many blankets have been dropped in soggy snow puddles! I love the blue squares B Blanket. What a great idea! I like the Rings B Blankets. The b blanket in circles would be perfect! -Kristin R.
Love the blue squares blanket. So fun and cute. Sky / Chocolate Shaggy Plush! It's tempting to just buy some considering how cold is it here! I love the sky/pewter plush blanket! i like the rings blanket. I love the super woobee in pistachio in chocolate!!! The Super Woobee would be great to keep in the trunk! I like the sky/pewter plush blanket. Looks comfy! I have a sister being induced today and another sister being induced tomorrow...so we'll have two new babies in as many days in my family. I'd love to win the cream/shaggy plush blanket for one of them. I would love to have the b blanket to keep my little man warm when he is n carrier. i would love to have a blanket to cover my daughter in the Bjorn...i always try to stuff the blanket around the edges but it always falls out! I would actually pick the celery green one! Do they make these for adults? Looks soooo comfy! Beggars can't be choosers... I love them all! I love the celery green b blanket. I love the rings blanket! Love the b blanket and the woobee in all black. There is nothing better than a great blanket. I would love the super woobee. Especially for a double stroller. I think the blankets are to die for!! :):) Thanks for posting about them. I have to have the woobee velvet Pistachio / Pewter. This is definately going on my list for the new baby!! i'd pick the Pistachio / Pewter woobee for sure! thanks! The Woobee Plush blankets look so soft and cuddly! I the B Blanket I like the Rings design. I love the b blanket -- what a great idea. No more stuffing and wedging the blanket around the babe! I love the turqoise and chocolate woobee. That is so cool and they look so soft! What a great product! I love everything! That celery green color is adorable! As a Seattleite AND a new mama to a one-month old who is just now big enough to start riding in the Bjorn, I would love a blanket from Rain or Shine Kids! I am partial to green, so I'd love the Rings Blanket - very cute! My 3 month old would truly appreciate the green b blanket! I love the plush blankets...they look sooo soft! I love the pink shaggy plush blanket. They all look great! I would love the squares blanket. so cute. I love brown and green! Those are such a great idea! I would love to win the Squares B Blanket. That blue would compliment my baby's blue eyes. The plush blankets look so warm!! definitely the b blanket... what a brilliant idea! I've been wanting a super woobee forever! I love that celery b blanket. So perfect. I would love a plush Wooboo blanket in cream/chocolate. Mmmm...pistachio/pewter from the Urban Series. Looks delicious! cool... I love the rings or squares....but all are so cool! lovin the rings blanket. pick me pick me! I'd love a b blanket! I like the sky/pewter plush blanket. So comfy looking! i love them all! they look so comfortable. We love the rings blanket! oh the celery green makes my eyeballs happy! I love the circles blanket! It would make a perfect baby gift! Love those B-Blankets! What a great idea! I would have totally chosen the celery green one anyway! It is so very cute! Very cute! I love the blue. The plush blankets look so cozy and the prints are adorable! That circles blanket is beautiful! I love the blankets the most, but I seem to love all baby blankets! i would love the extra big blanket in any color! WooBee Urban Burps in sky /pewter or the b blanket. I would love the ranch red woobie. Thanks! I love the circles blanket! Beautiful! I think I love the B blanket, but they are all SO cute!!! the rings b blanket, so cute & so needed for the winter! I love the b blanket, rings. Nice! Perfect for our nature walks in the rain! I love love the blue.....and love the sale I am definitly stocking up!! I love the squares b blanket! I love the circle blanket, but I would take the celery in a heartbeat. I love the plush blankets! Oh man do I want one of these! I really like the rings one that is sage green. SOOOO cute. i love the plush red and tangerine blanket. love it!! WooBee Blankets in red! I love it! I love the velvet tangerine and red blanket. What a cool design! WooBee blankets are the best!! The b blanket is my favorite. I love the pistachio and chocolate Woo Bee!! I like the rings blanket. THose look amazing! The b blanket is genius!!! I am such a blanket girl, too and the celery one is adorable...especially since I have a baby due in a coupleof weeks! I love the plush blanket! Ah. I was just looking at these posted on another blog and decided I really want one! I had my eyes on the celery green! I love the Super Woobee in tangerine and red! I love the plush blankets! There is nothing better than a babe wrapped all warm and cozy! I love the green blanket...especially since I don't know if it's a boy or a girl yet! The pistachio/chocolate Super Woobee looks so warm and cuddly! My son would love it. All of the b blankets are darling and you can never have too many blankets. i would love a super woobie! any shade of green is perfect! who could resist the woobee? I've never heard of this product before, but they look fantastic! gotta get one...I think the pistachio/pewter is my fave. The b blanket looks great for walks & running errands! I'd love to have one! i have wanted a woobee for two years now. so glad they are more economical. i LOVE the urban series, the black on black and the tangerine as well. My husband makes fun of me for my obsession with baby blankets. I would love to have one of the plush woobee blankets for the kids (and me too)! i love the rings blanket! so adorable. thanks! I would love the one they are giving away, to be honest! Thanks for the chance! Sky / Chocolate Shaggy Plush Blanket! I'm expecting our first and have NOTHING just yet...so any of these products would be great. I especially love the B Blanket, versatile and stylish! I have ALWAYS wanted a woobee blanket and would LOVE to try out their newest line. I think the rings blanket is my favorite of them all. I'd love to try this blanket! :) The circles blanket looks awesome! I really love the Woobee blankets in velvet. My son has lots of plush blankets he adore them all I think it would be nice to have one that's a different texture than all the rest. I have a lot of baby blankets, but this one seems too cool not to try to win! I love the pistachio/chocolate super wooboo. I love the Woobee blankets especially the print one with the red background. These seem to be really GREAT blankets and ones that will LAST forever. The Rings blanket is wonderful! Fingers crossed! I would love the Sunburst Blanket! It would match all my baby things :D. And it would come in handy next month when I bring home a new little one in this fridged Michigan weather. Those are sure cute and handy. Gotta love that! I'm totally in need of a the sunburst b blanket!! My baby girl just loves to throw her blanket off the stroller. I love the pink pewter plush blanket for the cold weather for my little girl! Cute! These blankets are a great idea. I love the super WooBee in Pistachio/Chocolate. I love circles...so circles it is! This would be perfect to use with the ergo. The sunburst blanket is so cute! I love the Circles one. Thanks for the giveaway and chance. 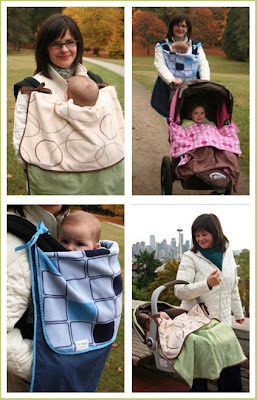 I would love to win the "rings blanket" for covering my beco carrier. Its been so cold, that i barely get out with the carrier anymore, what a great idea. I would love a Super Woobee!! I'd like the Sunburst b blanket! I love the Pink/Chocolate shaggy plush blanket! I really like the pistachio & chocolate velvet blankie. I soooo love the Turquoise/Pewter Velvet WooBee Bib! So adorably cute! I love the celery green blanket! I love the WooBee Print Blankets. Thanks for the chance to win!